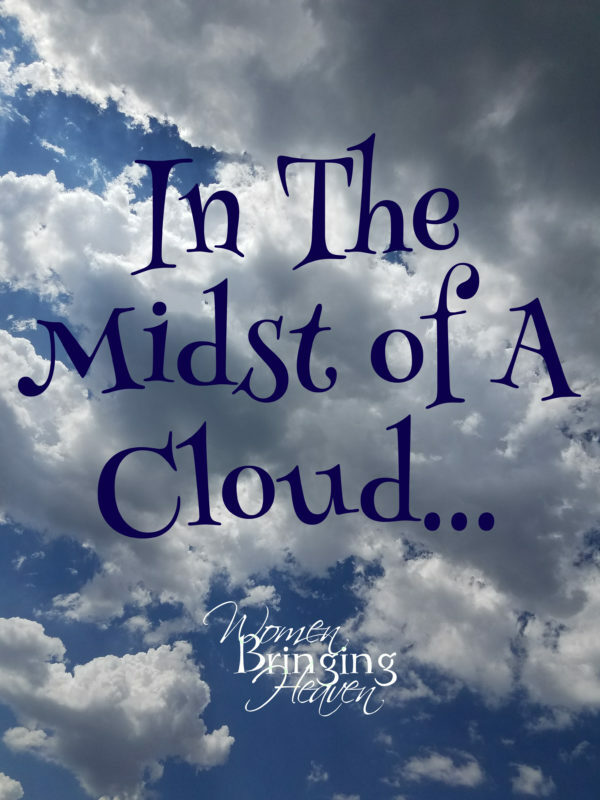 In my previous post, In The Midst Of A Cloud, I mentioned the worry of becoming distracted and being drawn out of a continuous presence with God and the joy that only comes from Him. What if an animal suddenly appeared in the fog and surprised me? Well, sadly, in life it is inevitable. There will always be “animals” that come looking for food, water, or shelter. What makes the difference, however, is how we handle them. In 2003, my two older children (who were both still babies at the time) and I moved with their father to Mesa, Arizona so that he could attend law school. I remember that on certain Saturday nights, the local news would put out a special about Arizona wildlife and how to live amongst the animals. The Phoenix metro area was quickly growing, people from all over the world were moving there, and new construction was being put up constantly. We humans had invaded the territory that they knew as their home and they were confused, and some were even angry. There were tips on what to do if a predator was in your yard, how to back away from a rattlesnake, who to call should you find a Gila monster, snake, coyote, or other wild animals on your property, and more. They included tales of forewarning with past examples, including one of a child that had been carried off by coyotes because the family kept feeding the coyotes and one day it showed up to find they had forgotten to put food out. 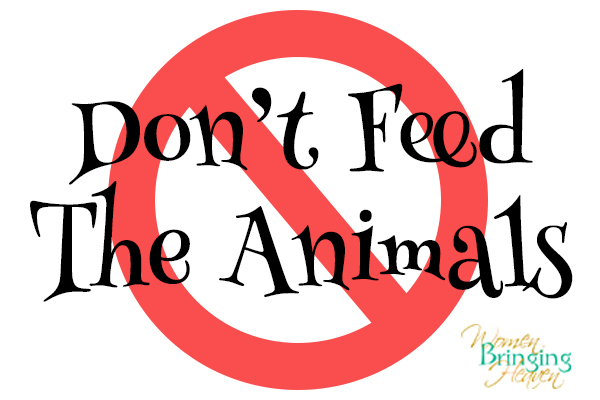 Their biggest point that was made over and over: DON’T FEED THE ANIMALS!!! I knew this from living in the country in Kentucky, and from stray cats in the suburbs of Southern California. Unless you want an animal to stick around, never offer it food or water. It becomes dependent on you and will refuse to leave, eventually annoying you and possibly cause grief in retaliation for its anger. So how should we handle the “animals” and distractions in a spiritual sense? The same way, don’t feed the animals. 3 For though we walk in the flesh, we do not war according to the flesh. If my thoughts and actions steer clear of the animals, when they appear I will be able to handle them in a way that my Father God approves of, especially if I am making the effort to stay in His continuous presence. HE MUST COME FIRST! However, if I take my eyes off of God and put them on the problem before me, I am leaving His presence to feed the animals. My mind quickly becomes overwhelmed and tired, unable to make sense of what is going on and missing the presence of my Savior. It is not an easy effort to keep our flesh from luring us away from where our spirit wants to be. It has to be a constant conscious decision to stay in His lap and ask God how I should handle the animals. It requires studying the Word of God and applying scripture to each and every situation. Not feeding the animals means that sometimes, though I could possibly fix a situation, I can’t. I have to stand back and remove my hands from the project so that He can move or so that I am not dragged into a place where the cloud (see the previous post mentioned at the beginning of this post) can’t move to. While sometimes God will have me help a situation with something He has willed me to do, I have to pray and use discernment to know whether I am working in a safe garden or if there is a critter there waiting to bite me. From time to time, I have to refrain from conversations that would lead to feeding animals, possibly hurting the feelings of someone that does not understand. No, it is not easy, but it is SO worth it and over time it becomes more and more a second nature. 19 Out of the ground the Lord God formed every beast of the field and every bird of the air, and brought them to Adam to see what he would call them. And whatever Adam called each living creature, that was its name. 20 So Adam gave names to all cattle, to the birds of the air, and to every beast of the field. But for Adam there was not found a helper comparable to him. God gave us dominion over the animals. We are not to be afraid of the animals! (I should write another post on how with scripture I overcame my intense phobia of snakes another time… I still steer clear though. No snake handling going on over here…) We have the right to tell the animals in our lives to get out of the way, we have dominion here and they are not to distract us. They are not allowed to control our mind or emotions. Oh, there’s a whole other blog post there, too… I’m sorry, and I used to be guilty of this, but your actions are not excused by your diagnosis. God has called you to act a certain way and clinging to a label that has been put on you instead of the name God gave you is not okay. Instead of Redeemed and Worthy, I used to answer to Anxiety, Victim, and more. I even expected others to know that was who I am and to cater to it. Don’t allow it! You were made for more! God gave us other humans to help us. WE SHOULD NOT SHUT OUT OTHERS! While their actions may involve animals, the people are NOT the animals. We are to help them, they are to help us, we are to be companions. There should be LOVE and not repellent. Especially our spouses, children, families, and those we have entered into covenants of ministry with. Genesis 2:18 states it clearly, IT IS NOT GOOD THAT MAN SHOULD BE ALONE! As a recovering introvert that took it way too far, I repeat this to myself a ton. There is nothing wrong with wanting alone time or needing more quiet time than others. But it is not good for us to only seclude ourselves. He gave us spouses, family, church families, and friends for a purpose. If another person, however, is allowing the animals to overrun them, this is the time to distance ourselves so that our minds are not overtaken by the animals of stress and worry. I have one last point I want to make with this, and it is the biggest. Not feeding the animals includes our thoughts. In fact, it is more our thoughts than anything, I believe. Think on these things Philippians 4:8, remember? Maybe we didn’t physically react to an animal. We ignored it and walked right into the house and it went on its way. But when you got in the house, did you sit at the window and wonder what happened to it? Did you lay awake and worry that it was going through your trash? Did you worry that it was a skunk and was going to spray and you’d have to smell it all night? We have to take captive our thoughts, ladies! The moment an animal appears, we need to turn from it or rebuke it, depending on the situation, and then pray every time it comes to mind. We have to make a conscious decision to not dwell on the animal but to pray about it and move on. That’s it, it’s done. No calling a friend and talking about it more than to ask for prayer to the point that another animal, gossip, has been birthed. No allowing your thoughts to run wild until you forget you left the gate open and anxiety wanders in. Keep the gates closed, don’t feed the animals, and stay in His presence. It’s not easy, it’s not always pleasant, but it is necessary to keep the animals away. I touched on this before, but I want to repeat it again: Always remember when it comes to the animals, Ephesians 6:12. In any situation, don’t start to feed and run with the animals. Wage not, meaning don’t gossip, argue, or act nasty. Don’t fret with anxiety. Your battle is not with another person. Our battle is with the enemy of our souls. Jesus already won that battle! 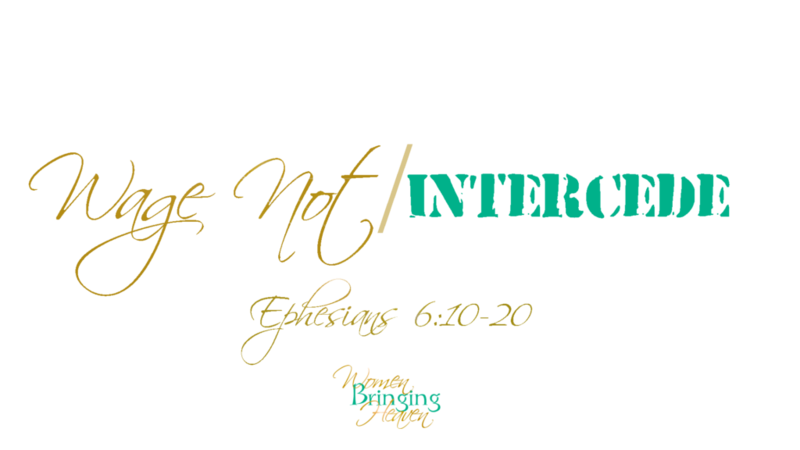 So wage not, but intercede! Intercede in prayer for the situation and leave it at the foot of the cross. Do you have some animals nagging at your door? Have you learned how to get them to leave? Are you in need of prayer? Feel free to comment here or join us in one of our Facebook groups. We’d love to hear from you! 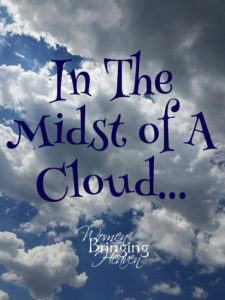 Have you ever been enveloped by a cloud? Watched it move in towards you and then suddenly be completely surrounded? It’s an eerie experience. Exciting, a tiny bit frightful, and often times very relaxing. 15 Then Moses went up into the mountain, and a cloud covered the mountain. 16 Now the glory of the Lord rested on Mount Sinai, and the cloud covered it six days. And on the seventh day He called to Moses out of the midst of the cloud. 17 The sight of the glory of the Lord was like a consuming fire on the top of the mountain in the eyes of the children of Israel. 18 So Moses went into the midst of the cloud and went up into the mountain. And Moses was on the mountain forty days and forty nights. Several months ago I went to pick up my son from school. 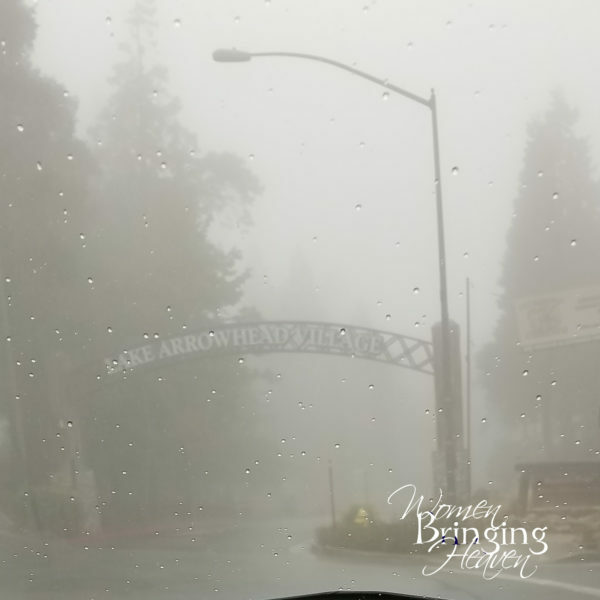 It is right on the ridge of the mountain and often times it will be bright and sunny at our home only a few minutes away, but his school will be, literally, in a cloud. 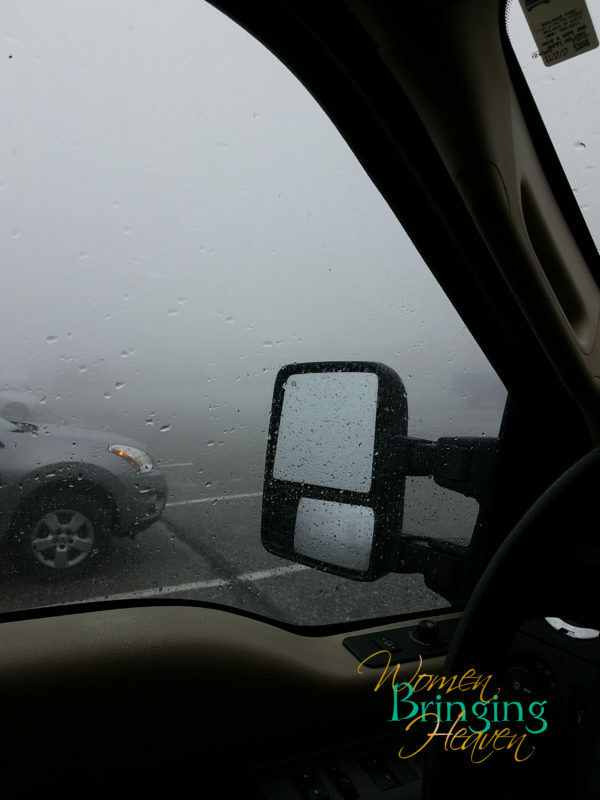 As I sat in the parking lot waiting for the bell to ring and the kids to be released I watched as the clouds approached the mountain. It was bright and sunny, and here came these clouds just bustling right up. Within about a minute, it was dense and the windows were wet. The wind picked up and I could see the fog blowing where the wind willed it. Before long I couldn’t see much of anything and all I could think of was Moses. Was this what it was like in the presence of The Almighty? This photo was taken another day but was pretty similar. If you look REALLY closely you can see the outline of the school buses. When I am in the presence of my Father, I am protected. Satan and his minions may wish to harm me, but the closer I am to my Savior, the easier the blow… if it even comes close. I could actually feel the cloud. No, I could not pick it up. But my breath was heavier and my skin was damp. Even my eyes had more moisture. The temperature dropped and there was a sudden chill. Again, I couldn’t see. I was unable to tell when my son walked out of the school to edge closer to the entrance. I didn’t have to worry about my bad hair day being observed by a parent in a nearby car. In fact, at this point, I was crying and worshiping my King and had no concern about anyone thinking what was going on with this crazy lady with the wild hair. I was isolated in the cloud. …And the point is that I wanted all of those things all of the time. Not just when I was able to stop and clear my head. I wanted it ALL of the time so intensely that should something come up and upset me, my focus was still on Him and my countenance left unaffected. I wanted my emotions to be so even with what God wills for them to be that while a circumstance may shift them slightly to the left or right, that they were quickly centered on Him. Like when you are riding a bike and almost fall but quickly line the wheels back up and have that moment of relief and think, “whew, okay, I’m alright.” Just like that. Then it popped into my head… old cartoons where the characters would be flying or fall off a cliff and keep going, but there were pieces of cloud with them… Jesus is always with me! I mean, duh, He’s in my heart, but keep hanging with me for a second. If my mind and focus stay on Him and Him alone and I don’t let something else take my attention… Much like DRIVING in a cloud of deep fog, (oh boy…) keeping my eyes only on the lines that guide the highway and not straight ahead, not becoming distracted by a car that is coming towards me for even a split second, my eyes on those lines, there is nothing to fear. If my eyes stay on those guidelines, I will not become blinded by the brightness. Have you had a similar experience to this one? 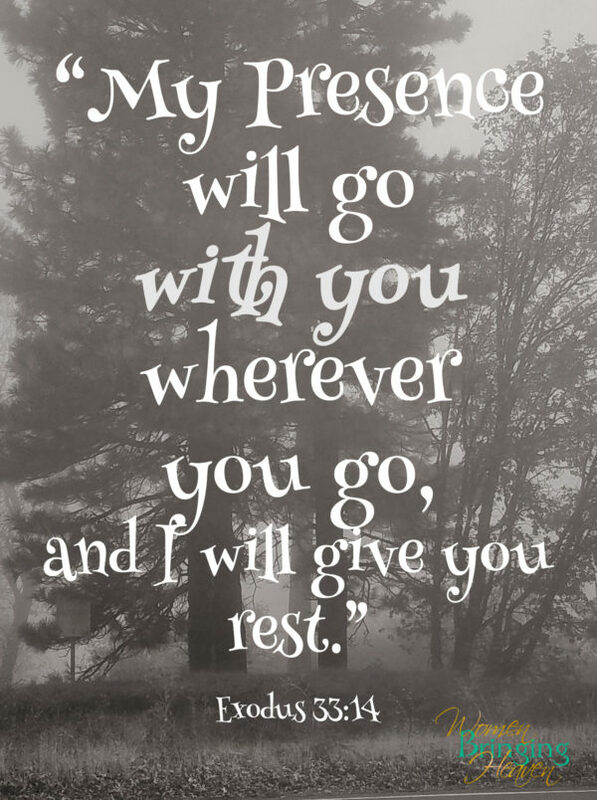 Are you wanting a deeper relationship with God that is at all times and not just when you are able to sit in silence? Have you been praying for a more God-centered life? Maybe you are like me and feel close to God, but just feel like there is more and He is drawing you closer. I’d love to hear about it! Feel free to post a comment, send me an email, or join one of our Facebook groups and tell me all about it!